Besant Technologies offers Best Python Training in Bangalore at Marathahalli, BTM Layout, Rajajinagar & Jaya Nagar, Kalyan Nagar & Electronic City. We teach students everything that is important- starting from basic to advanced concepts, that too in a real-time environment. We Rated as the Best Python training Institute in Bangalore with 100% jobs for freshers and experienced Professionals. Get good exposure on Python language with Development ,Networking, Analytics & Scripting environment. The reason why Python is so popular across the globe is that when it comes to object-oriented programming languages, Python is a trustworthy name. Although it is comparable to Java, Scheme, Ruby, and Perl, it stands out because of its own unique characteristics. If you too want to boost your repository of IT knowledge then attending python classes is a must. And with an abundance of academic facilities offering python training in Bangalore, you won’t have a tough time choosing the right training institute for yourself. However, if you want quality training at affordable prices, then Besant Technologies can be a great choice. Besant has been imparting the best python training in Bangalore for a long time now. So, receiving python training from Besant Technologies can indeed boost your career as an IT professional. Python is a high-level programming language released in the year 1991. Guido van Rossum was the person responsible for its creation. This interpreted programming language has a syntax that makes it possible for programmers to use fewer lines of code for expressing concepts. Besides, it provides great code readability. With python, one can undertake both small and large-scale programming without hassles. With so many benefits, python happens to be one of the most sought-after IT training courses today. If you are already excited to learn the ABC of Python, then enroll yourself in a python training in Bangalore. 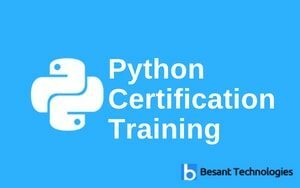 Don’t forget that you can receive assured high-quality training only from Besant Technologies, the best python training institute in Bangalore. Python is a great programming language for use in startups. Web development becomes easy when python is employed. A python job is always high paying. Artificial and machine learning can be taken far with python. The package libraries python boasts of being rich. When it comes to data science, python is probably the most used programming language. And it’s a cross-platform programming language. Python training Bangalore at Besant Technologies can simply set your career. Our incessant efforts in comprehending the possibilities of python in the world of IT have rendered us competent in helping interested people learn this skill set. Our trainers are some of the most knowledgeable in the industry with profound empirical knowledge and an enviable proficiency in theories. By following a student-centric approach of teaching, they have been ensuring impeccable learning outcomes in students. What makes us more popular as an IT training institute are our courses, which are not just easy to grab but also extremely relevant as far as industry needs and standards are concerned. We endeavor to keep you abreast of all the latest IT innovations and make sure every bit of information we pass on makes sense to you. What more? We offer amazing placement guidance and help you clinch your dream python job, almost effortlessly. Your dream to get a lucrative IT job can be a reality now, with a python training Bangalore. What makes training in this course important is proficiency. Yes, DIY learners don’t acquire the kind of proficiency, trained python experts boast of. You will know what you need to know or what the industry demands. You will not just be able to do away with unnecessary concepts but will also be able to figure out the areas that are more important from a career point of view. Besides, you will have experienced teachers to help with concepts, queries, and doubts. Basically, if you want to be a certified professional, you will have to take python coaching classes diligently. All you need is a python certification course, and you are all set to have a shining IT career. There are numerous job opportunities in the IT industry for people trained in Python. And if you want to capitalize on those opportunities, then enrolling yourself with Besant Technologies for a python course will prove beneficial. Some of the most important designations an IT professional trained in Python can take up in a company are Data Scientist, Research Analyst, Data Analyst, Software Engineer etc. Call us 9108126341/9108126342 for free Demo Session on Python Training in Bangalore BTM & Marathahalli get 1 hour basic knowledge on Python Topics.